A new study from the University of Arizona's Department of Agricultural and Resource Economics found imported fresh tomatoes from Mexico contributed around $4.8 billion in sales to the U.S. economy and the U.S. imported 3.4 billion pounds of fresh tomatoes from Mexico in 2016. The study found that U.S. imports of tomatoes from Mexico actively supported nearly 33,000 full and part-time jobs, earning $1.4 billion in employee compensation. It also contributed to $353 million in business owner income and $801 million in corporate profits. Tomatoes are a species native to the Americas and were first cultivated in Mexico. The U.S. and and Mexico rank as top agricultural export markets with one another, according to the study. In 2016, Mexico was the largest exporter of crops to the United States, with $11.6 billion in exports. Mexico is the United States’ third largest crop export market destination after China and Canada, with nearly $7 billion in U.S. crops exported to Mexico in 2016. The trade in tomatoes between the United States and Mexico represents a reciprocal relationship. The U.S relies on Mexico for fresh tomatoes while Mexico relies on the U.S. for processed tomatoes, according to the UA Department of Agricultural study. "This study demonstrates that even though grown and harvested elsewhere, imported produce supports economic activity, jobs, and income in the United States through forward and backward linked agribusiness supply chains," said Dari Duval, economic impact analyst with the UA Department of Agricultural and Resource Economics. 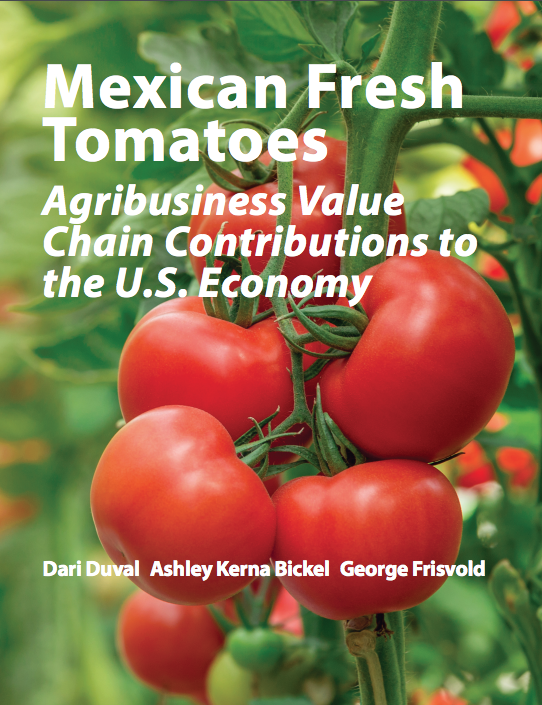 To view the full study of the economic contribution in imported tomatoes from Mexico to the U.S visit, cals.arizona.edu/arec/publication/contribution-mexican-tomatoes for more information.